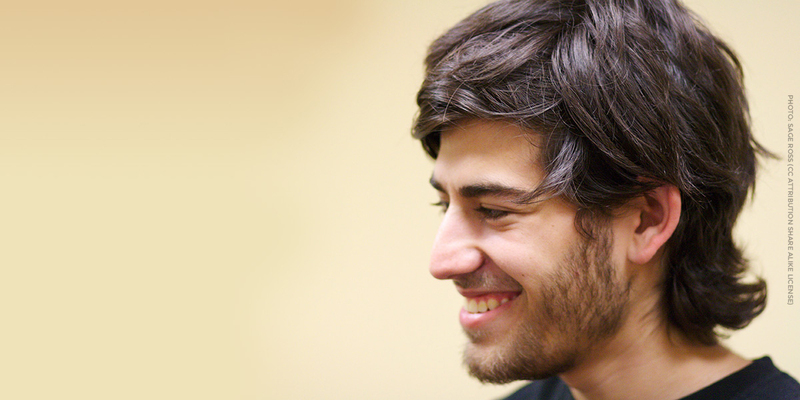 Join EFF and others on November 10 and 11 to celebrate the sixth annual Aaron Swartz Day, with a weekend of lectures, a virtual reality fair and a hackathon. This weekend we’ll join our friends at the Internet Archive in celebrating Aaron’s work as activist, programmer, entrepreneur, and political organizer. Aaron’s life was cut short in 2013, after he was charged under the notoriously draconian Computer Fraud and Abuse Act for systematically downloading academic journal articles from the online database JSTOR. Despite the fact that the CFAA was originally enacted to stop malicious computer break-ins, federal prosecutors have for years stretched the law beyond its original intent, instead pushing for heavy penalties for any behavior they don't like that involves a computer. This was the case for Aaron, who was charged with eleven counts under the CFAA. Facing decades in prison, Aaron took his own life at the age of 26. He would have turned 32 this week, on November 8. This weekend, you can help carry on the work that Aaron started. The hackathon, hosted at the Internet Archive, will focus in part on SecureDrop, a system that Aaron helped build for anonymous whistleblower document submission. It is now maintained by the Freedom of the Press Foundation. This year’s Aaron Swartz Day will also feature a virtual reality fair, showcasing virtual, augmented, and mixed reality work and several talks about the ways that artists, archivists, and programmers can use these new technologies. EFF will be demonstrating our own virtual reality "Spot the Surveillance" project, which teaches people how to identify the various spying technologies that police may deploy in communities. If you’re not a programmer, you can also volunteer your time to help with research projects on police surveillance and other topics, or user testing for VR projects. This year’s event also includes an impressive slate of speakers, including Chelsea Manning, journalist Barrett Brown, Freedom of the Press Foundation director Trevor Timm, and Aaron Swartz Day organizer Lisa Rein. EFF’s Executive Director Cindy Cohn, International Director Danny O’Brien, and Senior Investigative Researcher Dave Maass will also speak. At EFF, we have worked to continue the spirit of Aaron’s legacy. We have pushed to reform the CFAA in Congress, including through Rep. Zoe Lofgren’s proposed “Aaron’s Law,” and have advocated for a narrow interpretation of the law in the courts across the country. We’ve also sought to support Aaron’s mission to expand access to research online. In California, we successfully pushed for the passage of A.B. 2192, which requires that any academic paper that received state government funding be published in an open-access journal within a year of its publication. To our knowledge, California is the only state to adopt an open access bill this comprehensive. We continue to urge Congress to pass the FASTR—the Fair Access to Science and Technology Act (S.1701, H.R. 3427), which would require every federal agency that spends more than $100 million on grants for research to adopt an open access policy. These open access laws represent an important first step to making information more available to everyone. We hope to see some of you at this weekend’s Aaron’s Day celebration. For more information about the hackathon, and to buy tickets to the weekend’s events or just the opening night party, please visit the event page. Those who’d like to volunteer or need a free ticket are welcome to email aaronswartzday@gmail.com. To support EFF’s efforts on open access and CFAA reform, visit https://supporters.eff.org/donate.